The interesting thing about the adjectival use of the word “rank”, in Cordelia’s description of Lear’s crown of weeds, is that back in Shakespeare’s day “rank” did not mean a vile or repulsive odour, as it does in its colloquial usage today. Rather, “rank” meant proud, rebellious and sturdy and also fully grown. I have been spending a bit of time thinking about King Lear of late, and I’ve just started to think more seriously about his crown of weeds. I stumbled upon this image from a mid-nineteenth century production of King Lear, with Lear in quite a spectacular crown of weeds. This “rank” crown seems to lend itself to the old world meaning of “rank” that is proud, rebellious and sturdy rather than “rank” as a vile odour which would lend itself more to the trends in contemporary staging to represent his post-storm character in rags with a twiggy and ridiculous crown. What I like about this in particular is how heroic he remains when in the crown of weeds. He’s a plausible King, his weedy crown is a plausible crown. 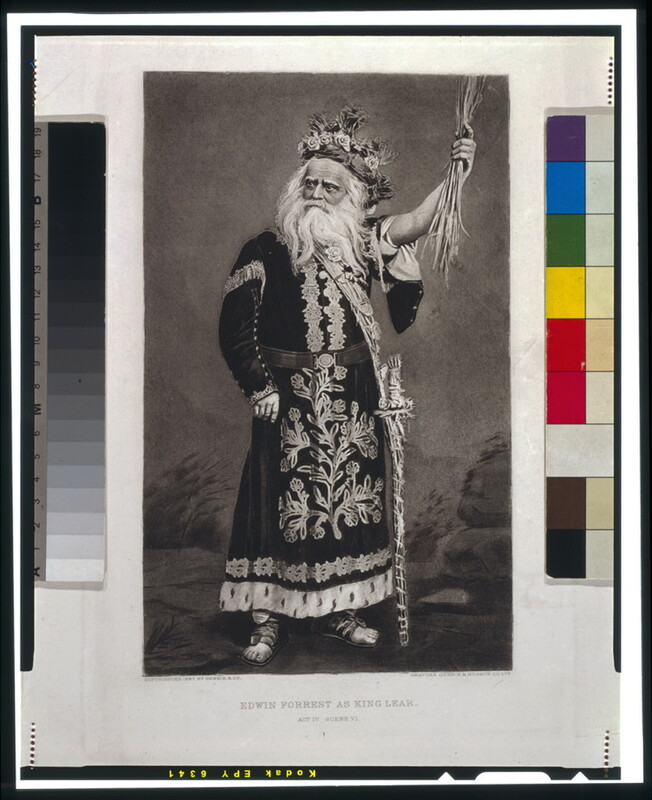 Rather than Lear’s story being a kind of riches to rags morality tale, this Lear looks like he’s just shifted sideways from one kind of riches to another kind of riches. He looks more like an Oberon (or perhaps a Prospero) than a Fool. I just wanted to share this image, i’ll think more about this weedy crown in the coming weeks. Well he is richer in a non materialistic way now, despite his loss of sanity! the people he has close are more loyal and trustworthy, and as his journey through the heath continues he begins to value these displays of loyalty and love, rather than the price tag attatched.